What Mochi Ice Cream Flavor Are You? What’s Your Mochi Ice Cream Flavor? 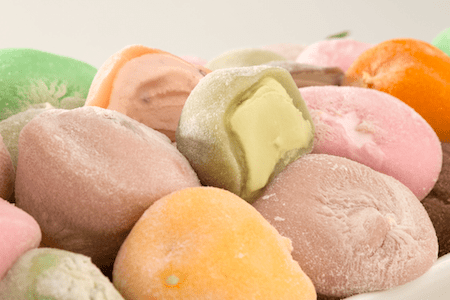 Do you know which Mochi Ice Cream flavor you are most like? You may have a favorite flavor, but does it match your personality? If you’re interested in seeing which Mochi is most like you, take a look below at a few of our favorites and see how they align with your personality! If you’re the thrill-seeker then Mango Mochi Ice Cream is your jam. Whether you’re into extreme sports, outdoor activities, or otherwise, this flavor is for you! Next time you’re getting pumped up to go on an adventure, grab a Mango Mochi for energy and get in the mood to have a blast. If you enjoy setting trends, well then you, my friend, are like Red Bean Mochi. It is all about the latest rage with you and you’re not afraid to find the next best thing and share it with your friends. Do you love discovering new hidden gems such as restaurants, shops, and more? Maybe you enjoy finding emerging artists, new hiking trails, or even traveling to exciting places you haven’t been to before. If the thrill of discovery is in you, then you are the pioneer, like chocolate Mochi. Its decadent flavor is exhilarating and puts a smile on your face, just like exploring does. Do you love snuggling up with a blanket and watching a good movie? Or perhaps you enjoy curling up by the fire and reading a book. If you’re introverted or enjoy relaxing at home in your slippers, then vanilla Mochi is your flavor. Its smooth, classic vanilla flavor is pure comfort. If you find yourself skipping every once in a while, belting out your best singing voice in the shower, or have an itch to run wild around an amusement park, you are a big kid at heart. You are fun loving and enjoy the simple pleasures in life like swinging at the park, riding your bike, or dressing up. If this sounds like you, then your Mochi twin is strawberry Mochi! If you don’t like change, then you are traditionalist. Whether you like having your home looking a certain way, have a daily routine that you enjoy, or even making sure that you keep certain traditions alive then your Mochi Ice Cream flavor is mint chip Mochi. Do you thrive in a group of people? If you enjoy entertaining, telling jokes, or going out on the town and dancing with your friends then you are the life of the party. The Mochi flavor that suites you best is plum wine Mochi, so grab a box and have fun without having to choose a DD. Are you the healthy type who enjoys cooking, practicing yoga or getting out in nature to retain your inner peace? If so, then you enjoy keeping a healthy balance in your life. Your Mochi match is green tea Mochi. With its soothing and refreshing flavors, you will be saying “Namaste” everyday. If you’re the type of person who enjoys knowing a lot about a certain activity or subject, you are the aficionado, which means your Mochi match is Kona coffee Mochi! Its bold, lively flavors blend perfectly with your quirky and intelligent side.